When measuring on shiny metals or machined surfaces that have small micro-machining marks on their surface, using a small laser spot is not recommended. This is because the micro-machined surface features suppress homogenous reflections, resulting in a noisy or unstable measurement signal. Laser sensors with an oval-shaped laser spot of just a few mm in width, similar to a short ‘laser line’, are recommended for these tasks. Interference caused by surface roughness, defects, indentations or holes are filtered out using the oval-shaped light spot combined with special software algorithms. Furthermore, this type of sensor is suitable for distance measurements on structured surfaces i.e. when the distance to the surface and not the structure itself needs to be measured. The oval-shaped light spot is not affected by the surface structures, enabling continuous, stable measurement values to be generated. 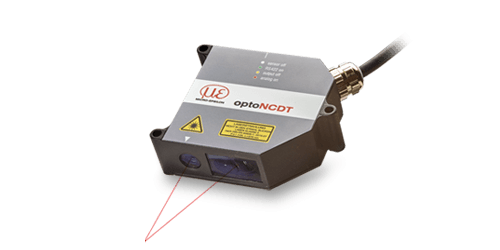 The optoNCDT 1750 LL is a special laser sensor for shiny metals and structured surfaces. The oval laser spot facilitates a particularly easy and precise measurement on shiny metal surfaces or structured objects. Laser sensors from the optoNCDT 2300LL series have been developed with an innovative lens arrangement which produces and elongated elliptical spot (or small laser line). Although not visible to the naked eye, this change in the spot geometry allows a natural surface averaging. Combined with an advanced surface compensation algorithm, this combination dramatically reduces measurement signal noise levels, especially on shiny, glossy, porous or rough surfaces. Compared to a conventional standard laser spot, this measuring stability is dramatically improved, even when measuring at the extreme high rate of 49kHz! Additionally, the optoNCDT 2300LL has the new Ethernet interface which is used for remote configuration, diagnostics (through the devices own IP address) and output measurements. Conventional serial RS422 and analogue outputs are also offered if preferred. 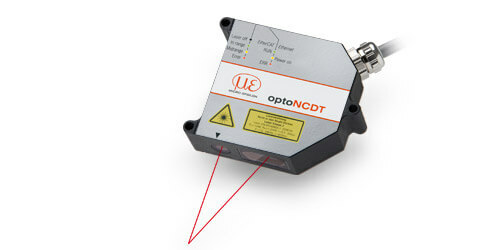 Please click here to return to the complete optoNCDT laser sensors family.